GUALFIN, Argentina – We are recounting our last days at the ranch… while we are en route to Paris. As you will recall from yesterday’s Diary, we rode through the canyon to the valley on the far side. The two valleys, ours and this one, are side by side, separated only by the aforementioned El Colorado mountain. But they are very different. Ours looks like what it is – a high, dry, semi-desert cattle ranch. It is big and majestic. But it is cold and windy, too. This valley was as big as ours but not majestic… and there was no sign of any cattle. It was more like our little valley, where we have our grapes. The difference is water. They have water all year round; we don’t. They could use their water to produce high-value crops – anise, onions, pimiento, grapes, walnuts, and quinoa. In comparison, our business strategy is modest… and marginal. We hope we get enough rain in December and January so the cows don’t die before the following rainy season, 11 months later. Cattle ranching up here was always a chancy business. We passed a few people working in a field, separating corn from the stalks. They were working, but without much conviction. They seemed softer and rounder than the people from our ranch. Our people are harder and tougher. They have to be. They live in adobe houses without heat… even when the temperatures drop as low as zero degrees Fahrenheit. On Saturday, we visited Felix and Eleena. The couple lives on a tiny plateau up in the valley above our vineyard… about two hours by horse. Felix is 80. Eleena claims to be 74. But the deep crevices in her face suggest she could be 100. The two of them live where Eleena was born… and except for their battery-powered radio, their lives have scarcely changed. They have cattle, goats, and sheep up in the mountains. At their little homestead, they have just enough water to keep an orchard and a garden. They never see a doctor. They’ve never been sick. And they’ve never watched TV or lived in a heated house. Our people garrison the furthest reaches of civilized life. Beyond the ranch, out to the West, there is nothing but the high grasslands of the puna – where the air is so thin… the water so scarce… and the temperatures so low… that humans can barely survive. Driving across it – from the Atacama Desert – from Chile, travelers are advised to take some oxygen with them, for example. But here, even octogenarians, such as Felix and Eleena, range over the mountains like wild goats. They have no need for oxygen… and no use for the things people in the rest of the world take for granted. Maybe there is some equilibrium in nature. Maybe those who live in such difficult circumstances all their lives find Heaven particularly pleasing. Even the evil ones among them are happy go to Hell; at least they get a chance to warm up. When we finally got to our destination, three and a half hours had passed since we entered the canyon. Now, it was midday. And we had been invited for lunch. 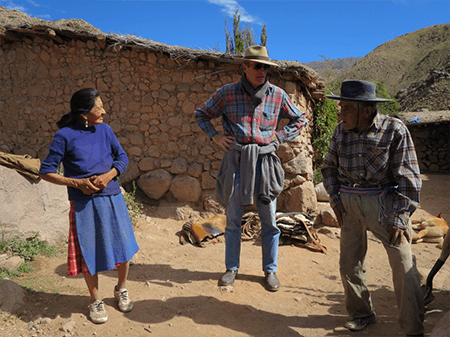 Our hosts were a Swiss couple who had bought a small farm at the foot of El Colorado, where it bumped into the next mountain in the sierra, Durazno. They had discovered a microclimate, where water from the two mountains gushed down into their irrigation ditches, even while it was bone dry on the other side – our side. There was green grass everywhere and fruit trees… bushes… grape vines. It was a paradise… an Eden of greenery and sun. They had no tractor. And used no chemicals. Instead, they cultivated behind a draft horse – a Percheron – and were forever at war with ants and other pests. They had no electricity at their house. They used only candles. But the house had a modern, Swiss look – small, efficient, and very pleasant. It must cost almost nothing to live there, but it was as comfortable, and as charming, as any house we had ever seen. They had prepared an asado – an Argentine barbecue – and proposed their own wine as a lunchtime libation. Everything was delicious. We were enjoying the friendly discussion with Jorge and the Swiss couple when Jorge nervously looked at his watch. People are friendly in this part of Argentina. The distances are vast. But the community is small. So, people take advantage of opportunities as they present themselves. If a neighbor is near, he is invited to visit. As near as we can make out, the valley has three major farms of about 30,000 acres each, plus the Swiss couple’s little jewel of about 50 acres. Two of the other property owners asked us to stop by before we left. One is a charming and energetic man from Buenos Aires. We had met him briefly at the airport in Salta (the closest city). He taught at The Wharton School in Pennsylvania and now travels widely as a business consultant. He bought the farm almost by accident – at a tax sale. His idea was simply to sell it later, when the market improved. But the more often he visited, the more he liked it. Now, he is hooked… like us and the Swiss couple. He’s planted about 70 acres with grapes, which seems to the rest of us a bold and ambitious move. The wine business is a tough business, too. Raul reported that activists from all over the province had invaded his farm and claimed it as their own. He called the police, who set up a road block outside the farm entrance to prevent any further trespass. The police stayed on the job for six weeks. Raul took the ringleaders to court for illegal trespass; nothing further has happened. The sun was already dropping low in the sky by the time we got back in the saddle. Jorge, now even more eager to see us get underway, bid us farewell, reminding us not to forget to take the right fork when the river split in two, on our way back to the ranch. He was worried that we wouldn’t be able to find our way back in the dark. The river to the left, by the way, leads to an enormous property called Jasimana. It is a place we’ve heard about often; it adjoins our ranch on the south side. The property is about 3 million acres. From time to time, you see it advertised for sale for as little as $1 million, the seller hoping to put one over on a gullible foreigner. But Jasimana has no real owner. It is a strange territory, where thousands of squatters, originarios, traditional farmers, and small landholders have lived, unmolested by the outside world, for hundreds of years. For generations, no owner has managed to exercise dominion over the property; anyone who tried to do so now would most likely face unpleasant consequences. But something always goes wrong. It was already about six o’clock in the evening. We would have to ride for two hours up the riverbed; that part should be easy. Then we would enter the canyon after dark; that part wouldn’t be so easy. Still, horses can see better at night than we can. And the local people often travel by the light of the moon. Except there was no moon. Not yet, at least. Just stars. We entered the canyon gingerly. We were eager to get to the other side and nervous about riding through unknown country in the dark. We had been in it only about 20 minutes… Everything was going well. Maybe the horses really could see in the dark. Maybe God looks after midnight riders, as well as drunks and half-wits. Maybe the next U.S. president won’t make a worse mess of things. Maybe the Fed won’t cause a financial disaster. And maybe growing old won’t be so bad. Then, our horse suddenly plunged into quicksand. It was the same place Jorge had warned us about the day before. But coming from the other direction, in the dark, we hadn’t recognized it. We have little pools of quicksand on our side of the mountain, too. The cows and the horses know where it is and avoid it. Still, sometimes, a cow will sink in… fight against it… and die from cold and exhaustion. We’ll find it days later, dead in the mud. Our horse sank in to its belly. It panicked, pitching its rider onto the rocks. Everything happened so fast. It must have gotten a foothold on something. It freed itself and was back on solid ground before we had time to stand up. “Are you okay?” asked Elizabeth. “I hope so,” we replied. In fact, we got a little banged up. But nothing serious. We got back on El Bayo – one of the mischievous horses we’d caught eating our flowers last week – and continued on through the canyon. Once on the other side, the countryside opened up. We were able to pick up a little speed, now on the dry riverbed… until about a half-hour later, we saw a light. It was Carlos’ house on the edge of our own vineyard. We were “home” again.